Look around your neighborhood, especially if you live in zone 5. Do you see any trees blooming in June? 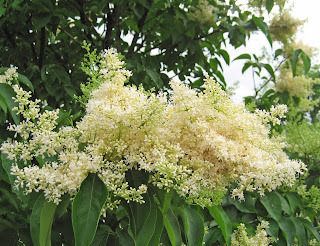 You do if someone has a Japanese Tree Lilac (Syringa reticulata 'Ivory Silk') in their garden. I don't know why more people don't plant this small tree, as it provides a flush of bloom in early June (in my garden) at just about the same time as the many shrub type lilacs are a pleasant memory. It has a sweet scent but I have to get right up next to the flowers to smell it, whereas lilacs like Syringa patula 'Miss Kim' flood the entire yard with scent in May when they are in bloom. The tree lilac's one flaw in my garden is that it really has no fall leaf color to speak of, or at least not that you would notice when compared to a tree like a red maple. You most likely won't find these trees at big box stores. 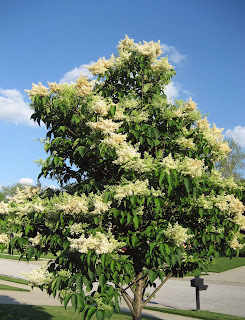 To get a Japanese Tree Lilac, you should go to a good garden center or nursery. And try to get a named variety like 'Ivory Silk'. I think we can grow that up here in zone 4, too. Do the blooms smell as lovely as the shrub lilacs? So, that's what it is! We have two of those trees in the front of our house that the city planted between the sidewalk and the curb. They are so pretty right now and they do smell good! I'm so glad to finally know what they are. I also finally made it to the grocery store today and bought the grapefruit. I'm hoping those pillbugs gravitate to it. What a pretty tree! I wonder why I've not noticed it in your yard before? We have one of these in our garden. I can smell it when we sit on the patio in the evening. Maybe you have to be out there in the evening to smell it. They are pretty trees. The bark is what gives them winter interest. It is peels. The leaves and blooms make it look delicate but it is a tough tree. I'm on the fence about this tree. I can't decide if I like it or not. I'm not sure why. Our village has planted several along Main Street, so I can visit them if I feel like taking a walk. I have one in my northern Illinois garden. It isn't blooming yet, buds just forming. (We have had a strange spring here, bloom schedules way different than usual). Anyway, back to the tree, it's one of my favorites. Such masses of airy bloom. I don't think I've ever noticed one of those around here. Our June blooming tree is a Kousa Dogwood. It is just starting to come in right now and ought to be beautiful for bloom day. Okay, you all are killing me with your ravings about 'Miss Kim' lilac being amazingly fragrant. I had one in my yard for 3 years at the old house and got gorgeous blooms from it... but NONE of the great old-fashioned lilac fragrance! In fact, I thought that they had the fragrance bred right out of them. I wonder what's going on--how could 'Miss Kim' not like me?!!! lol. Oh, I wish I could grow that..we can't grow lilacs here on the Gulf Coast,,however, we do have Wisteria and watermelons..LOL..so that makes up for it. Annaliese, I think you can grow them up to zone 3. They have a scent but it isn't as strong as shrub lilacs. Robin's Nesting Place, I am happy to see my post helped you identify one of your trees. Sherry at the Zoo, I think you haven't noticed it before because you've not been here when it is blooming. When it isn't blooming, it is just a regular tree. Lisa at Greenbow, I agree that this is a tough tree, after all this one suffered that horrible spring we had last year. Mr. McGregor's Daughter, Like many other lilacs, the tree is rather plain when not blooming. Roses and Lilacs, This has been a strange spring indeed. Daphne, Yes, I had forgotten about Kousa dogwoods blooming late, too, and on my way home yesterday I noticed the catalpa trees are also blooming now. Blackswamp_Girl, I wonder what is going on because honstly my 'Miss Kim' lilacs have a very strong scent. Try getting another one. Eve, yes there are plants you can grow that I can't that make up for this fine tree. Thanks all for the comments and additional thoughts. Dear Anonymous, I'm not sure exactly how tall this tree will get, but I'd guess not more then 15 - 20 feet. It is not a dirty tree like the Bradford pear, if you mean dropping limbs or losing leaves all through the winter, and not in the fall. How far from a house foundation should I allow? I live in Zone 5, Wisconsin, and desperately need some shade in my tiny city backyard. We're tall people, can it be limbed up to allow 6' clearance under it? I live about 30 miles NW of Chicago, and have seen lots of these trees near my sister's home in Cary. I can't seem to find a small sapling, however. Mostly all that's available is around $200, and I'm a cheapskate - I want a small less expensive one so I can grow it myself. Does anyone know who might sell younger trees? BTW, these can grow to 50 feet, and are gorgeous in bloom & very fragrant. Growing from seed is too complicated for me! We have a Japanese tree lilac in our garden, and the first year it bloomed nicely, but the last two years, it has had only a few flowers, and this year just 1. It is not near a fertilized lawn so it does not get over fertilized, gets at least 6 hours of sun, and has not been pruned. it is about 10 feet tall, and a lovely healthy tree otherwise.